Ferndale, Mich. -- Downtown Ferndale will host Bike Night on Thursday, part of the Downtown Development Authority's new ARTWN program that aims to feed Ferndale residents' growing interest in art around their community. Bicycle Night will feature the reveal of the DDA's first on-street bike parking rack, which will accommodate 14 bikes in the space of one parking spot. Created by local sculptor Richard Gage, the rack is the first of six on-street racks the DDA plans to install throughout the district. 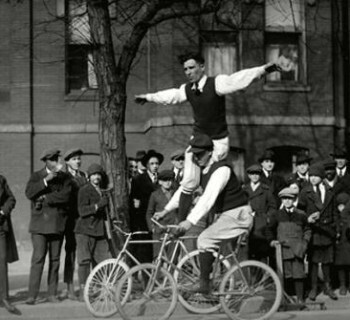 "A good number of our consumers are dedicated bicycling commuters. 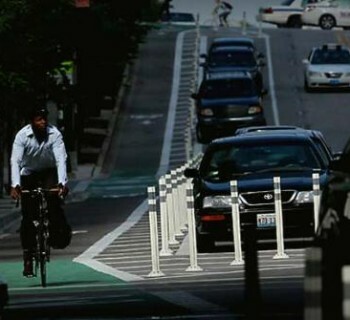 This rack really affirms that bicycles are a viable mode of transportation and very much welcomed here," said DDA Executive Director Christina Sheppard-Decius. "It also offers some relief on our parking system." The Downtown Ferndale Bike Shop will offer free bike safety checks, and residents can apply for a bike license with the Ferndale Police Auxilliary. 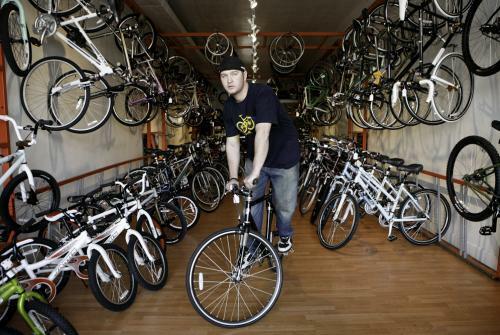 "We'll make sure everything's working right on people's bikes so when they go out and ride they don't have to worry about it," said Jon Hughes, owner of the Downtown Ferndale Bike Shop. "Ferndale is such a bike-friendly city, and there are so many people around here that ride bikes not only for fun but as their form of transportation." In addition to being a fun event for bicyclists, Bike Night will also bring attention to bike riders in the city, he said. "It helps promote cycling but also just helps people be aware of us on the street so it's a little bit safer for us to ride," he said. The bike shop will also feature a bike ride Thursday evening that will end at Danny's Irish Pub, where drink specials will be offered for anyone who arrives on bike. The bike racks will be unveiled in front of Western Market at 6 p.m. Thursday. Over the past two years, the DDA has installed 33 single/double bike racks at locations around town. The multi-space rack to be unveiled Thursday was initiated to continue to develop and encourage bicycle usage within the district. Gage, who built the rack in his Hazel Park studio TANK 425, was commissioned to create are beyond the basic function. "Bike racks are usually just that, but when we approached Gage about making Downtown Ferndale's something more than functional, he was immediately a very involved and enthusiastic partner," said Sheppard-Decius. The event is part of the DDA's Third Thursdays initiative, featuring the recurring Metro Detroit Street Easts food truck rally outside the Rust Belt Market, and shopping open until 9 p.m.
Thursday night will also be the first meet-up of Skirts, Heels and Wheels - a new women's bicycling group that celebrates riding in everyday clothing. "Bicycle Night is a great way to roll into our summer of activities and special events," Sheppard-Decius said. "It's the night to leave your care in the driveway and ride into town. Save money, get healthy, have fun."